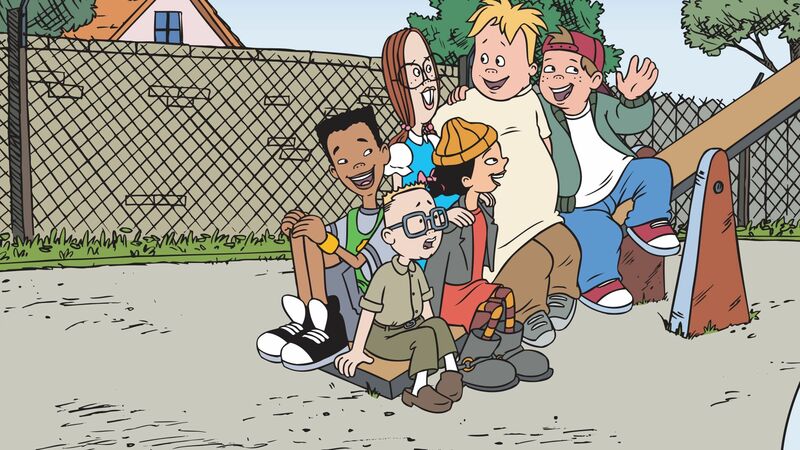 Here's where to watch every episode of Recess season 4. Mouseover or tap an episode to see where to stream it. Click or tap the play icon to stream it on the best available service. The First Picture Show Sep 12, 1999 SeÃ±or Fusion: the Movie finally opens and T.J. vows to be there at its first screening. The Big Prank Sep 12, 1999 The kids rope T.J. into a challenge to play a prank on King Bob before the end of the school day. Hustler's Apprentice Sep 13, 1999 Gus winds up working for the Hustler Kid to pay off a debt, and soon he himself becomes the biggest hustler in the playground. The Spy Who Came In from the Playground Sep 13, 1999 The main kids make a friend of new kid James Stone and show him all their little schemes, but soon regret that. Gus' Fortune Sep 19, 1999 The kids find a paper fortune teller on the ground that predicts doom for Gus. Rumor Mill Sep 19, 1999 The kids want to find out who started a rumor that a boy knocked over Mikey's popcorn at the movies and Mikey then threw the boy into the girl's bathroom. Recess is Cancelled Sep 22, 1999 Secretary of Schools Garrison chooses 3rd Street School as the place to test his program to bring test scores up by cancelling recess. Tattletale Heart Sep 22, 1999 The kids warn Gus not to break the code by telling Miss Finster who started a food fight. Call Me Guy Sep 26, 1999 Gus takes a new identity when he discovers that people think he's a different cool kid when he doesn't wear them. Too bad ""Guy"" can't see a thing. Prickly is Leaving Oct 3, 1999 Prickly finally gets his appointment to Spiro T. Agnew Middle School. But the kids try to make him stay after they meet the new Principal Slicer. Randall's Friends Oct 3, 1999 Randall gets the main kids to pretend that they're his friends when his father, Leonard, visits the school on Randall's birthday. The Biggest Trouble Ever Nov 7, 1999 The gang gets busted when they accidentally break a statue of a famous hero. The Rules Nov 7, 1999 The original 1935 edition of The Rules of the Playground is discovered in the library. Gus and Misdemeanors Nov 8, 1999 The bad kids from The Girl was Trouble trick Gus into shoplifting candy from Kelso's. A Science Fair to Remember Nov 8, 1999 Second grade prodigy Becky Benson befriends Gretchen to get help for her science fair project. But she has an ulterior motive. Mikey's Pants Nov 14, 1999 The gang tries to cover up Mikey's ripped pants so Finster won't catch him. Here Comes Mr. Perfect Nov 14, 1999 Jared, the new student, appears to be perfect, making the rest of the school very jealous. Good Luck Charm Nov 19, 1999 Spinelli gets too attached to the lucky marble that Vince loans her. Diggers Split Up Nov 19, 1999 Digger Dave quits digging and then bosses everyone around. Schoolworld Nov 21, 1999 The school gets a new technology system installed called the SAL 3000 which controls everything. The Dude Nov 28, 1999 T.J. and the gang meet Mr. Dudicoff, a student teacher who was a legend at 3rd Street School back in the day. Partners in Crime Nov 28, 1999 Menlo and Randall team up to manipulate the entire playground. The Candidates Nov 29, 1999 Gretchen and Vince both run for president. Spinelli's Masterpiece Feb 6, 2000 Spinelli channels her anger into a playground chalk drawing. Nobody Doesn't Like T.J. Feb 6, 2000 T.J. can't figure out why Gordy doesn't like him. Yope from Norway Feb 13, 2000 When a new kid from Norway comes to 3rd Street School, Gus befriends the kid by making him think that Gus is the hottest kid in the school. Bonky Fever Feb 13, 2000 Scared of turning 10 on his soon-to-be bithday, Mikey develops an obssession of becoming a little kid again so he won't have to grow up. Don't Ask Me Feb 20, 2000 Spinelli becomes popular as an advice giver when she sits in for Guru Kid. The Secret Life of Grotke Feb 20, 2000 Ms. Grotke's strange behavior makes the kids think that she's a spy. The Fuss over Finster Feb 21, 2000 Miss Finster hurts her leg and can't keep up with the kids during recess. Soccer Boy Feb 21, 2000 Mikey makes the other kids regret not letting them play on their team for the playground's soccer tourney. Fort Tender Feb 27, 2000 The bored main kids build their own fort. But then Lawson takes it over. Germ Warfare Feb 27, 2000 Gus starts an obsessive crusade to kill all the germs in the world, while Mikey will do anything to save them. More Like Gretchen Feb 29, 2000 Spinelli gets peeved with her parents heap so much praise for Gretchen at her expense. Prince Randall Feb 29, 2000 Randall uses an embarrassing photo to blackmail King Bob into making him Playground Prince. Me No Know Mar 1, 2000 Vince feels like an outsider after he misses the must-see movie of the weekend. Good Ole T.J. Mar 1, 2000 Gretchen is worried when she's partnered with T.J. on a class project. Chez Vince Apr 30, 2000 Disgusted by the horrible cafeteria food, Vince becomes the new school cook when the other kids try his cooking. Tucked In Mikey Apr 30, 2000 Needing to prepare himself for a poet laureate ceremony, Mikey decides to listen to Menlo to learn how to organize himself. Old Folks Home May 7, 2000 Mikey badgers the gang into a trip to senior citizens home. Some Friend May 7, 2000 T.J. has a mysterious new friend. Old Folks Home Jul 17, 2000 The Recess Gang take a visit to the Old Folks' Home, only to be surprised. Some Friend Jul 17, 2000 T.J. has a mysterious friend who appears to be Menlo.